If you know anything about snakes you might be familiar with snake inclusion body disease, or IBD. 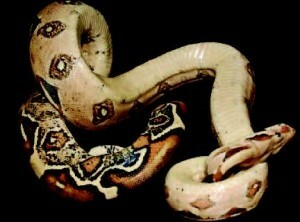 This transmissible and fatal disease affects snakes of a variety of species but has been best studied in boas. The name comes from the presence of large masses (inclusions) in the cytoplasm of cells from infected snakes. IBD might be caused by a novel arenavirus. To identify an etiologic agent of IBD, RNA was extracted from multiple organs of snakes with the disease, and subjected to deep sequencing. This analysis revealed the presence of two distinct arenaviruses. One virus, called CASV (California Academy of Sciences virus) was found in diseased annulated tree boas, and the second, GGV (Golden Gate virus) was detected in boa constrictors. These sequences were found in 6 of 8 IBD snakes but not in 18 disease-free controls. The finding of arenaviruses in snakes is interesting because these viruses are thought to infect only mammals. Rodents are believed to be the natural host of arenaviruses, which are classified as Old World or New World depending on where they are isolated. In rodents, arenavirus infection is typically asymptomatic. When arenaviruses infect humans, severe disease can result, such as hemorrhagic fever caused by Lassa virus. How CASV and GGV are transmitted to snakes is not known. One possibility is that they are introduced into snakes when they consume mice. The viruses might be transmitted among snakes by contact or via vectors such as blood-sucking mites. The genome sequences of CASV an GGV are very different from those of rodent arenaviruses. If similar viruses circulate in rodents, they have not yet been detected; alternatively, CASV- and GGV-like viruses might have diverged from Old- and New World arenaviruses after many years of transmission among snakes. Another surprise emerged from analysis of the CASV and GGV viral proteins. Arenaviral genomes encode four main proteins: an RNA polymerase, L; a nucleoprotein, NP; a transmembrane glycoprotein, GPC, and a zinc-binding protein, Z. The amino acid sequences of CASV and GGV L, and NP, but not Z and GPC, resemble those of known arenaviruses. The CASV and GGV glycoproteins are instead related to glycoproteins of filoviruses and retroviruses. This observation suggests that recombination took place between the genomes and arenaviruses and filoviruses or retroviruses, likely a very long time ago. ….sequencing can only ever identify candidate etiologic agents, and demonstration of causality requires significant additional experimental effort. This additional work would include the demonstration that infectious virus can be consistently recovered from diseased snakes, and that the disease can be induced by inoculation of snakes with the virus. As a first step towards answering these questions, kidney and liver extracts were added to cultured boa constrictor kidney cells. By 5 days post-infection, viral RNA could be detected in the cell supernatant, but it is not known if the viruses produced are infectious. This work shows convincingly that the host range of arenaviruses is much broader than we thought: they do not just infect mammals. The zoonotic pool continues to grow, and there are now more potential sources of new human arenaviruses. The work also emphasizes that our knowledge of all the viruses on the planet remains miniscule. Mark D. Stenglein, Chris Sanders, Amy L. Kistler, J. Graham Ruby, Jessica Y. Franco, Drury R. Reavill, Freeland Dunker, and Joseph L. DeRisi. 2012. Identification, Characterization, and In Vitro Culture of Highly Divergent Arenaviruses from Boa Constrictors and Annulated Tree Boas: Candidate Etiological Agents for Snake Inclusion Body Disease. mBio 3:e00180-12. favorite viruses, so first of all, thank you very much for this. course, this is no easy thing to do. receptor usage for these new viruses), also the matrix protein Z seems to differ in some important aspects from the typical arenavirus Z proteins. This could have some major implications on what we think to know the biology of arenaviruses. Indeed a very fascinating story, I´m very much anticipating follow-up studies. during the last century and has not yet been found in any other mammal. bats really are the natural reservoir of TCRV (http://www.ncbi.nlm.nih.gov/pubmed/22379103), one reason beeing that TCRV was the only arenavirus isolated from non-rodents – until now. I wonder if there is a common source of mice fed to these snakes? Could this be a mouse pathogen that is infecting the snakes when they are fed? It would be interesting to see if any of the snake food producing companies that supply mice to the pet stores or via mail order are positive for the same virus. Maybe similar viruses infect mice asymptomatically? I’m getting ready to trap some wild mice for sequencing; maybe we’ll find them.